The Gray Lady put up her paywall in 2011. By 2017, subscription revenue topped $1 billion, with the company adding 157,000 new subscribers across digital and print in the fourth quarter. Over 2.6 million people now subscribe to the digital version of the New York Times. The New York Times wants to get people in the door. In December 2017, they reduced the number of free articles someone could read from ten to five to push acquisitions. COO Meredith Kopit Levien said that this was because demand for journalism was “at an all-time high.” They want to use this unique point in history and the resulting media frenzy to drive revenue. The discount is for the first year, with an automatic renewal at the full price in year two. Media companies like the New York Times see the opportunity to get people in, get them hooked, and then gain the LTV in the second year onwards. 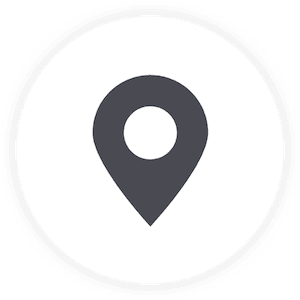 The discount works to reduce that initial friction, but they could be reducing friction in other ways without hurting their bottom line quite so much. The one Peter focused on was pricing page design. "This is their symbol for delivery, and I didn't know that meant delivery. I don't think this is the right setup. Even if I'm a 55-year-old grandmother in Florida, or a hipster liberal in Brooklyn, or a conservative person in Montana, it doesn't matter who I am, I am still confused about what I'm looking at." The focus here shouldn't be this initial segmentation. It should only be getting people into the service, seeing the benefits, then having them upgrade and choose features they care about. By making the subscription page tough to parse, they are increasing friction and then have to fight this with a discount. Make the page easier, the pricing easier, and the discount can be removed without hurting acquisition. Segmentation is vital, and with such a wide subscriber base, the New York Times has to use it to their advantage. Looking at the data, there are a few options. The people who want home delivery are willing to pay a lot more than the digital-only subscribers. 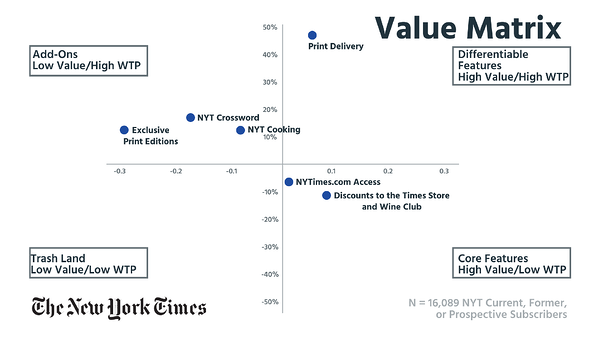 Having home delivery as one of the main packages makes sense, although the Times might want to bring subscribers in at a lower price point and offer this, and other features such as NYT Crossword or NYT Cooking as add-ons to the main package. This is scattered. 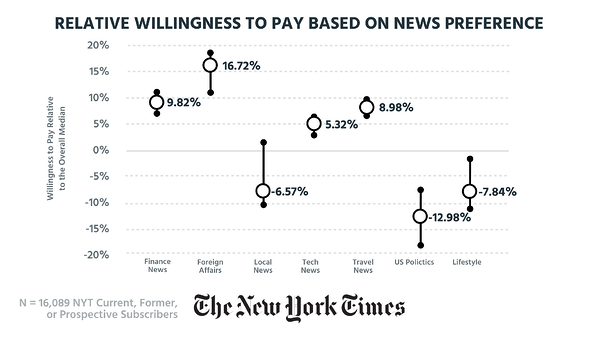 People are willing to pay more for financial news and less for domestic news. As in the Netflix Price Page Teardown, category doesn't offer a good segmentation opportunity. A few people may only read finance, but the majority of users read a broad spectrum of news and want access to it all. If you are in a metropolitan area, you have an 18% higher willingness to pay than the average. 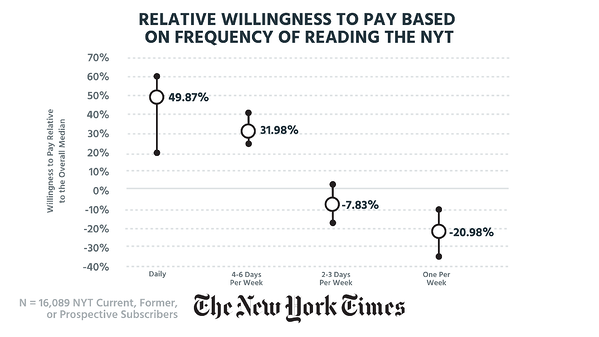 People living in rural areas don't want to pay so much for the news, at least the news from the New York Times, with their willingness to pay trending into the negative. 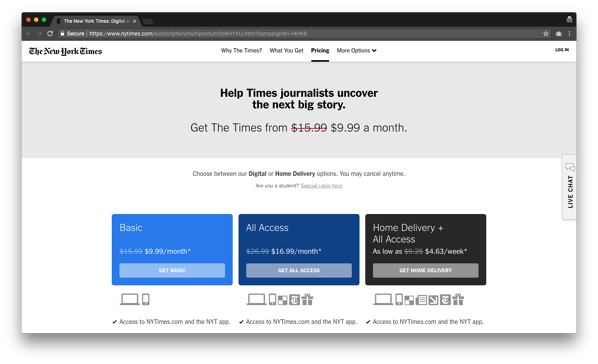 Localizing pricing is something more often associated with different countries, but there is an opportunity for the New York Times here to local by region even within the US. Those in the 18-34-year-old bracket that have grown up with the internet and never bought an actual newspaper in their lives have the lowest willingness to pay, at 6% under the average. 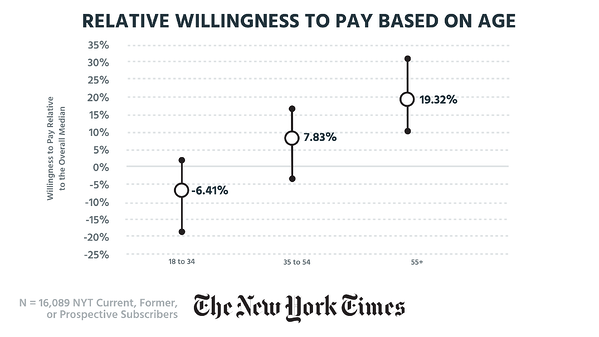 People in the 35-54-year-old bracket have a slightly higher and more positive willingness to pay. But it is the 55+ people that the New York Times really has to attract. Yet these are the people that will struggle the most with the confusing current pricing design. 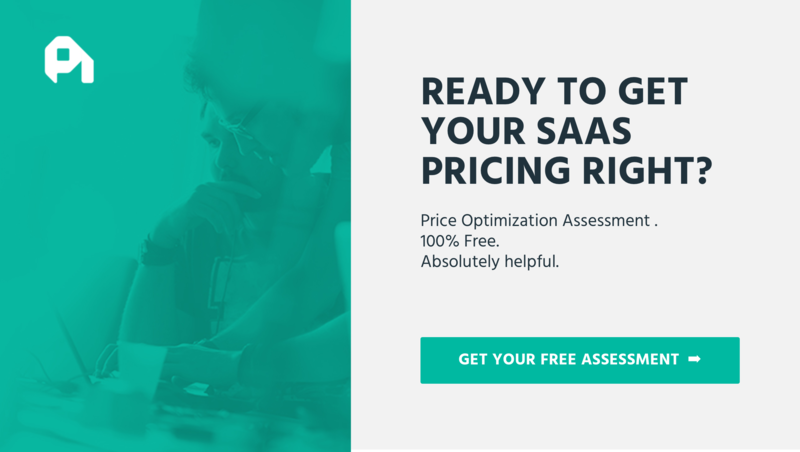 If you have a billing system that can offer dynamic pricing, and you have the data to support it, this option can help you present the right price point to the right customers. In this case, a 58-year-old Manhattanite visiting the New York Times site might be offered just the top plan, with home delivery and crossword, and no discount. They want this package and are willing to pay. A 20-year-old living in the country will come to the same site and see a discounted plan that just lets them read online. In both cases the customer gets what they want, and so does the New York Times.